As is the case for us, our four-legged friends may require anesthesia as part of a surgery or procedure. Kittens receive anesthesia when they are spayed or neutered, and most pets receive anesthesia at least once more during their lifetimes. General anesthesia is achieved by administering drugs that suppress your cat’s nerve response. During general anesthesia your cat is in an unconscious state, so he is unable to move and doesn’t feel any pain. Anesthesia can also be administered locally, to numb a specific area or part of the body—such as a tooth, area of the skin, or the spinal column. Is Anesthesia Risky for Your Cat? There are always risks when any anesthetic agent is administered to a patient, regardless of the length of time the patient is anesthetized. In fact, it is estimated that approximately 1 in 100,000 animals will have some sort of reaction to an anesthetic agent. * Reactions can range from mild to severe and include a wide variety of symptoms, such as swelling at the injection site to more serious outcomes, such as anaphylactic shock or death. While these statistics seem alarming, your cat is just as much at risk getting into the car to go to the veterinary hospital for the anesthetic event. The good news is there are many things you can do to reduce your cat’s risk! Fasting for several hours prior to anesthesia, as directed by your veterinarian, is important to reduce your cat’s risk. If your cat has not fasted prior to anesthesia, he could vomit and possibly aspirate food or fluid into his lungs, even with intubation (tube to keep the airway open). This could potentially result in a condition called aspiration pneumonia, which can be life-threatening. 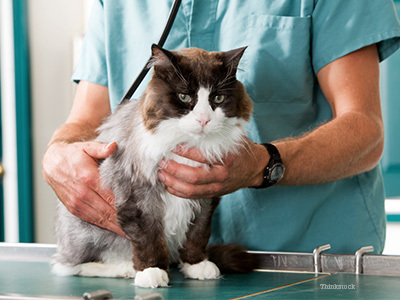 Make sure your veterinarian knows your cat’s complete history before the anesthetic event. His vaccine history, lifestyle and any medications he takes all influence how he may respond to anesthesia. Your veterinarian may recommend a presurgical examination and diagnostic tests that help identify any underlying conditions that should be addressed before your cat undergoes anesthesia. Additional tests may be added on an individual basis. Your veterinarian will recommend what is right for your best friend. The placement of an intravenous (IV) catheter as part of the anesthetic preparation. The catheter can be used to provide anesthetics and intravenous fluids to keep your pet hydrated; additionally, if needed, it would serve as a pathway to directly administer life-saving medications, should a crisis arise. Intravenous fluids to help maintain hydration and blood pressure. IV fluids also help your cat with his recovery process by aiding the liver and kidneys in clearing the body of anesthetic agents more quickly. Your veterinarian and/or veterinary staff will answer any questions you may have before your cat receives anesthesia. They may ask you to review and sign a consent form that describes all of their recommended services prior to the anesthetic event and during the procedure. It is very important to review the forms and have all your questions answered. Several safeguards are put into place to help reduce your cat’s risk during anesthesia. The surgical assistant/veterinary technician: A technician or assistant is present during the anesthetic event to monitor your cat’s vital signs and to help adjust anesthetic levels, under the direction of the veterinarian. A heart rate monitor counts your cat’s heartbeats per minute. Anesthesia and other factors, such as surgery itself, can affect heart rate. By monitoring your pet’s heart rate, your veterinarian can make anesthetic adjustments quickly. An electrocardiogram (ECG) monitors your cat’s heart rate and heartbeat pattern. It can detect abnormal heartbeats called arrhythmias. If an arrhythmia is detected, your veterinarian can make suitable changes in anesthesia. Core body temperature may be monitored, especially if your cat is undergoing a prolonged surgical procedure. Changes in body temperature can cause dangerous complications. A blood pressure monitor measures your cat’s blood pressure. When used in conjunction with other monitoring equipment, it provides detailed information on your pet’s cardiovascular condition. Pulse oximetry may be used to monitor the amount of oxygen in your cat's blood and his pulse rate. Carbon dioxide( C02) is often monitored together with oxygen, as it helps determine if your cat is receiving the right amount of oxygen during anesthesia. How Soon After Anesthesia Will Your Cat Be Back to Normal? Recent improvements in anesthetic agents allow for a quick recovery and your cat should almost be back to normal when you pick him up after the anesthetic event. He may seem more tired than normal when he goes home. This has as much to do with the stress of his visit to the veterinary hospital as to the anesthetic itself! Make sure you follow all go-home instructions for your cat including feeding instructions. If you are at all concerned about your cat’s recovery, call your veterinarian—your key resource when it comes to the health and well-being of your best friend. *This information came from material written by Ernest Ward, DVM.